Tired of wearing all black? I know, I didn't think it was possible until I started feeling stuck in a rut. If you want to embrace color but don't know how you aren't alone. We have all struggled with this problem, but you don't have to. 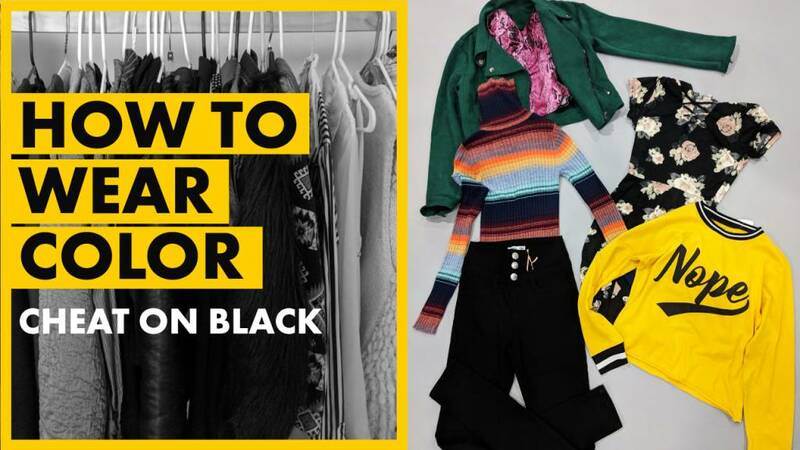 Here's a guide to using color in shopping and how it can change the way you think about yourself AND color. The internet is going crazy for Marie Kondo, and we agree with her joy methodology. In fact, Darin would routinely purge her own closet with the mantra "Do I LOVE this?" and force me, now 27-years-old to do the same throughout my upbringing. This philosophy of "Does this bring me joy" is the founding block of ebhues. When you find your own color palette, your world opens in possibilities. I NEVER imagined myself wearing a green or a yellow, but now I wear both. I feel more comfortable in my own skin and also more confident in my color choices. Here’s how. While the fashion world has embraced black, we find that people who know the right colors for them, move away from their monogamous relationship with it. Even if you look great in the starkest black (which counter to popular belief isn't always true), color creates a moving persona where before there was only a blank slate. When you get a color analysis, you get step by step instructions on what the color can be used for and why you should use it. A week ago I looked at my closet. It felt cold, uninviting, and most importantly BLAH. I had a few items of color, that when worn, elicited the most amazing feedback. Compliments I never heard when I wore my former love black. While I hadn’t quite connected color to compliments, I did feel a decided lack of enthusiasm for my fashion and my mornings. Here is what my closet looked like. To get to this closet I purged mountains of clothes. When you go through your clothing Darin says to do the following. Everything that isn’t your color or doesn’t catch your eye in the color realm goes. Anything that isn’t comfortable to wear or that doesn’t feel right when you wear it goes. If the color is right and the fit is right but it looks frumpy on you and doesn’t enhance your assets… BYE! Or, and perhaps this shouldn’t be said if it is not in good condition it needs to go. When I sorted by these factors I ended up with four large boxes of hand-me-downs and clothes I’d had since I reached my final height at the age of 16. About 90% of it was black. I was ready to move on. When you’re shopping it’s important to come up with a game plan. While I was pretty much in need of everything, I did make a point to give myself rules. Everyones' rules will be different but mine was as follows. No black or white clothing. No black because I wanted color and no white because I am too irresponsible to keep things white. Buy for work and play. Buy outfits that can be mixed and matched. Try to get something in yellow, blue, and green. So in order to understand why the outcome of my shopping trip was so amazing, you should know that I hate shopping and I’m also extremely picky. However, using my swatches I was able to breeze through stores so quickly and find only the most colorful, cutest clothes. These are colors that I may have been too afraid to get without my swatches. Certainly ones I lacked the confidence to choose without second thoughts at the check out counter. I went through an entire mall and two outlet stores in a breeze. It was honestly shocking. The most important aspect of it all was that I actually kind of had fun doing it. I did end up buying two black pairs of pants, but only because I actually did need some and they are great staples. Here is my haul and it includes clothing with a different aesthetic style than I would normally gravitate to, but because it happened to match my shopping swatches I ended up trying them on. Are you near Chattanooga? Give us a call at 423.266.6222 to book your own Personal Color Analysis. Using our system you find all your best colors, save money on clothing, and feel more confident in your own skin. Not local? Read about out online drapes. We can send you swatches based on your results. Feel free to leave us questions! We love hearing from you!